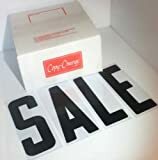 Sign Letters set of 300 - 8 inch Copy-Change Condensed Portable Sign Letters. The 8" letter is printed on 8 7/8" high clear plastic back. The flexible .030 mill thick plasitc bends to insert into the signs letter track. Copy-Change letters is the thin flexible plastic type sign letter commonly used with portable roadside signs. 2 ea. - & # cc " ?